Andy Ockershausen:	This is Our Town. This is Andy Ockershausen and a conversation with a very dear friend and a very important person to me and to Our Town. His name is Bobby Goldwater. Many, many times. I have thought to ask you this question, are you related in any way to the Arizona Goldwaters? Bobby Goldwater:	Yes. I am told, that there is a distant relation. My sister, once upon a time did a family tree. We are, this is what she told us, fourth cousins twice removed, from the Arizona Goldwaters. I never met Senator Goldwater. My father and my brother did, but I did not. Andy Ockershausen:	… and a member of Our Town, he lived in Our Town in an apartment complex, and I used to go into the drug store, he went into the druggist all the time, but I met him and then I had the misfortune fortune, I was a delegate to the Republican National Convention to support Barry Goldwater because he was such a, at the time a fresh breeze and a thing. He was a Westerner as you know, and he lived it and breathed it. His family lived it. I went to his department store in Phoenix one time, just to make sure it was there, but he didn’t have anything to do with it. I think his brother ran that. Bobby Goldwater:	Well, the family did, and the first time I was in Phoenix I said to myself, “You know, I’ve got to go to the department store because it has my name on it.” So I went in, I did some shopping, and I hand my credit card to the clerk, and she sees my last name, and she calls the assistant manager, and the assistant manager is going, “Oh, Mr. Goldwater, Mr. Goldwater, was everything okay?” I’m trying to convince her that I am not that Goldwater, I am not part of that part of the family, and I couldn’t convince her so I just let it go. She was very nice, she couldn’t have been nicer, but it was just funny, but I took a shopping bag with my family name on it. It was great. Andy Ockershausen:	And your own Goldwater. Bobby, that’s a great story, but that was a big part of your life. The name I’m sure when you were growing up in the business and you’re a New Yorker. Scarsdale High School. Andy Ockershausen:	That’s a very wealthy neighborhood, Scarsdale, I would say. Bobby Goldwater:	People think that, yes. Andy Ockershausen:	Scarsdale High was sort of like Hollywood High on the east. I mean they had all the celebrity. And you went to Miami University of Ohio, which is a long way from Scarsdale but not. Scarsdale is the upper grade high school as I remember. Bobby Goldwater:	Mm-hmm (affirmative), it is. Andy Ockershausen:	And the University of Miami is fabulous. Bobby Goldwater:	We’re very sensitive about that. Andy Ockershausen:	And they make a big thing of that too. Bobby Goldwater:	Yes, we do. Andy Ockershausen:	Donna Shalala, right? Andy Ockershausen:	I know that. Bobby Goldwater:	… in Florida. Andy Ockershausen:	But Ohio is such an important part our culture because there’s an Ohio school, it’s not Ohio State, right? Andy Ockershausen:	University of Ohio. Bobby Goldwater:	There is Ohio University in southeast Ohio, in Athens. Bobby Goldwater:	There is Ohio State, of course, there are many state schools and then one of them is Miami University. Andy Ockershausen:	It, that a state school? Andy Ockershausen:	I did not know that. A very famous school though, with a great sports program for a small college. Bobby Goldwater:	It has always had that and it’s known as the cradle of coaches. Bobby Goldwater:	… yup, but a lot of very famous football coaches, successful football coaches went to Miami. Andy Ockershausen:	Were you interested in sports at the time? Were you looking for a sports course or a relationship in sports at Miami? Or we’re you just a broad student? Bobby Goldwater:	Well, kind of-sort of. My dad was the sports publicist at NBC in New York for 13 years when I was growing up. Andy Ockershausen:	Is that after WWII, right after the war, is that when you got into it deep? Bobby Goldwater:	Well, he started at NBC in 1955. Andy Ockershausen:	Oh, I gotcha. Bobby Goldwater:	Back then, things were not as specialized as they were today. He was THE sports publicist for NBC network. Bobby Goldwater:	One of the first people actually that I remember because they lived maybe five minutes from us. A very famous person here in Washington DC, but the time he was probably one of the top sportscasters and all the United States was Bob Wolff. My Dad was Bob Wolff’s publicist because Bob Wolff was doing all of this work on NBC. Bobby Goldwater:	Yeah, that’s what I’m saying. Andy Ockershausen:	Bob Wolff, I knew him very well. Andy Ockershausen:	A delightful man. Andy Ockershausen:	I’m sure your dad had tickets for everything. Bobby Goldwater:	Yeah, yeah or credentials. Andy Ockershausen:	That’s the way it went, right. Andy Ockershausen:	What was the population of Scarsdale at the time? Bobby Goldwater:	… Oh, 20,000 maybe. Bobby Goldwater:	High school, my graduating class I think was for 460. Andy Ockershausen:	… so you had the benefit of is this good breeding from your dad and the training that he gave you without giving you training, you were part of it. Bobby Goldwater:	Well, he taught me everything I needed to know about how to write so to answer your other question, I never took a course in journalism at Miami, yet I was the co-sports editor for two years and the editor in chief of the Miami Student, one of the oldest college newspapers in the United States my senior year. But I never took a journalism course because my dad taught me everything I needed to know about writing. I never took any course that said sports in it at Miami, but I was involved with it very, very much. Andy Ockershausen:	One of the things that I have found out over the years, I coach young people and always looking for a job in broadcasting or a job in journalism or a job at the paper and, “What should I do? I’m going to a journalism school,” and I say, “Well, whatever you do, please take a course in history, take a course in geography, take a course in craftsmanship, take a course in writing and be a journalist.” You cannot learn to be a sports writer in college. You can only learn to be a sports writer by being a sports writer. Bobby Goldwater:	Well, that’s right and I guess I took your advice without knowing that you would give it. I majored in American Studies. Andy Ockershausen:	What a great opportunity for you. Bobby Goldwater:	Which was the most interdisciplinary of majors that you could possibly have. Andy Ockershausen:	Look what it’s done for you Bobby. Bobby Goldwater:	And so it was a great major and I love Miami. It’s a great school. Anybody who has somebody thinking about going to a liberal arts college, they should really consider Miami. Andy Ockershausen:	I like to bring those things up because people should know there’s more to Bobby Goldwater than your experience. You went to Madison Square Garden. You worked for The Garden. Andy Ockershausen:	Was that with your dad? Bobby Goldwater:	No, no, no. No, no, my Dad, I started working at the Garden, my dad had become the sports information director at Fordham University. I started at The Garden in 1974. It was my first job out of college. I thought I was going to be a sports journalist. I had job offers in Ohio and back in New York, but there was this writing job in the public relations department at The Garden and I just decided to go that direction instead of another direction. Bobby Goldwater:	And so I wound up at The Garden for 24 years. Andy Ockershausen:	I mean, that’s incredible, you started and you didn’t even want to do it. You ended up running the place. But that was a fabulous time too. Andy Ockershausen:	Had the Garden moved to its new location then? Bobby Goldwater:	Yep. The Garden is now in its fourth location, the present location, they just did a billion dollar renovation of the place. I used to know, when I was there, I used to know every doorknob and cinder block in that building, but I don’t anymore. They did a magnificent job renovating it. It’s a transformation. Andy Ockershausen:	Who owns the Garden now, Dolan? Andy Ockershausen:	Yeah, it never was owned by the city, was it? Bobby Goldwater:	… no, no, it’s always been private. Andy Ockershausen:	It’s always been privately owned. Andy Ockershausen:	Paramount, movie business right? Bobby Goldwater:	… well essentially, but they owned us for a number of years. Then they sold to Viacom. Viacom sold us to ITT. ITT had a minority partner which was Cable Vision. Cable Vision took us over in 1996 and then over time has become what it is today. Andy Ockershausen:	… isn’t it, Cable Vision? Andy Ockershausen:	Which is a gold mine of course for the city and for everybody, but The Garden is still near and dear to your heart. I’m sure. Bobby Goldwater:	Absolutely. Greatest place in the world. Andy Ockershausen:	It’s a wonderful place. And then you have an opportunity to move from the Garden to La-La Land. Bobby Goldwater:	… yeah, I thought I was going to be a lifer. I really did. Why would you leave? But I got convinced to leave. Tim Leiweke, who was the president of the Los Angeles Kings at the time and was putting together this new arena in Los Angeles, working with the owner. Philip Anschutz. He and I had become very good friends over the years and he, the short version of this story is he convinced me to come. Now, Tim is the best salesmen in our industry. He can sell sand to a lifeguard. He can sell anything to anybody, and he sold me on leaving. Andy Ockershausen:	That’s a whole new arena, of course. Bobby Goldwater:	… brand new arena. When I arrived there, the building was a hole in the ground with two concrete columns sticking up and we were designing it and building it at the same time. We had no events booked, barely a staff. There was a few hold over people from the LA Forum and the LA Kings. We had no policies and procedures as an organization and we had to get all that done in 15 months. And we did. Andy Ockershausen:	And they dumped it on you. Bobby Goldwater:	Well, no, no, no, it wasn’t a dump. This was something that, it was exhilarating and very challenging. Andy Ockershausen:	You loved it. Andy Ockershausen:	And you can do it. Bobby Goldwater:	And we developed a great team and a terrific arena. Andy Ockershausen:	Now I want to talk to you about Los Angeles, but first I want to take a break. This is Andy Ockershausen talking to Bobby Goldwater and we have moved from New York to La-La Land and I’ll be right back. Andy Ockershausen:	This is Andy Ockershausen. I’m speaking with a wonderful, wonderful man. Thank God he’s a part of Our Town now, Bobby Goldwater, who I’ve moved him from New York to Los Angeles right? The La-La Land, people love to live. The greatest basketball player of the year has moved to Los Angeles for one reason, he wanted to live in Los Angeles. That attracts a lot of people that city, the climate. Bobby Goldwater:	Well, I would want to believe that he moved there for another challenge, which is kind of what I did too. He’s just a little more visible about it than me. Andy Ockershausen:	But you love that. You love that association with the Kings. Bobby Goldwater:	I did. I did find out however, that I was an east coast guy. Andy Ockershausen:	How long did that take? Seven, eight years? Bobby Goldwater:	No, it took about maybe a week because the pace of Los Angeles is just different than New York. It just is. We had all this stuff to do, getting ready, trying to get Staples Center together and we’re working so hard and it gets about to be 5:00, and at 5:00 people who know me know I’m just warming up at 5:00, I’m just rolling up my sleeves at 5:00 and some people are looking outside, they see the sun, they know the traffic’s going to be out there and they’re looking, they’re watching and say, “Well, time to go, we’ll see you tomorrow.” And I said, “Wait a minute, we got stuff to do.” Well, they’d leave. Andy Ockershausen:	Yeah, it worked. Bobby Goldwater:	… beat the weather, it’s beautiful. But I just realized that I just need more energy and a faster pace. I’m just an east coast guy. Andy Ockershausen:	Did they pay to recruit you to come east, come back to Washington? Bobby Goldwater:	Yes, I was recruited to come here. After the building opened, after Staples Center opened, I was asked to start a new business division for the organization, which now is my little one person office turned into AEG, which is a 20,000 person global company, but it was at one time a one person office. Andy Ockershausen:	Bobby Goldwater office. Bobby Goldwater:	Well, yeah, it was just me and so I just started a lot of initiatives that all worked out. They did a fantastic job with this. Andy Ockershausen:	So you stayed for the deadline and opened the stadium, of course. Bobby Goldwater:	Yep. And then started this new business division and I was in Los Angeles for a little less than three years, and again, I thought I was going to stay a lot longer, but then I got recruited to come here. They were looking for a president and executive director of the DC Sports and Entertainment Commission. And I was thinking to myself, “You know, running RFK stadium, which was 40-something years old at the time and the DC Armory, which was 60-something years old at the time, who wants to do that?” But what they were looking for, what they told me they were looking for, and I got convinced that was in fact what they were looking for. They were looking for somebody to try to figure out how to bring major league baseball back. Andy Ockershausen:	Oh yeah, absolutely Bobby. Bobby Goldwater:	So I came back here for that project. There were other responsibilities, but that was the project I came back here for. Andy Ockershausen:	That was primary. I would have mentioned that, but you stole my story because I know that for a fact, I used to call you Mr. Baseball and now I don’t want to insult you when they are losing. But Bobby, you did it, you brought the knowledge necessary that was going to happen with baseball because it wasn’t about the city or the town was about relationships and you had a relationship. Bobby Goldwater:	Well, you’re kind to say that. The real starter of this frankly was Mayor Tony Williams. I met him and the Chairman of the Sports and Entertainment Commission at the time, the chairman of the board, John Richardson at the Democratic National Convention, which I helped bring to Los Angeles in 2000, in the summer of 2000. That’s when I met them. Andy Ockershausen:	Wow, that’s ancient history, 2000. Bobby Goldwater:	It is. Now Vice President Gore had not wanted to come to Los Angeles, the convention wouldn’t have come there, but we made it very, very easy for them to say yes. Tim did a great job, the city, everybody. A lot of people did that. I led the bid, but there were a lot of people who contributed tremendously. That’s when I met Mayor Williams and John Richardson and the two of them were very convincing and of course I was always a baseball fan. I have family here in Bethesda who had been here since the fifties. So I’d been here a lot and like everybody else, why the heck isn’t baseball back in DC? What’s the problem? Of course, it should be in the Nation’s Capital. Andy Ockershausen:	Did you research it to find out why before you moved? Did you look before you leapt? Andy Ockershausen:	His client incidentally. Andy Ockershausen:	Take a shot. Bobby Goldwater:	So I did. I came here in November of 2000. Andy Ockershausen:	Was Jim Dalrymple . . .
Bobby Goldwater:	He was gone, he had been gone a year. Andy Ockershausen:	Yeah, he went somewhere, I don’t know where Jimmy went. Bobby Goldwater:	Yeah, he had been running the Sports and Entertainment Commission. He left. Andy Ockershausen:	Yeah, that was a different job than yours. You were the baseball guy. He was just a stadium guy. We had been told a story way back by Bowie Kuhn a name that was a Washingtonian at the time, that his story was, he didn’t think major league baseball would ever do anything in Washington unless it was one owner. And that was his story. That was years and years ago. And I think Bowie probably reflected the ownership of the other team. I don’t know why that was, but that’s what the story was. Bobby Goldwater:	Well, when I got here, I really didn’t understand what the project was. I knew what the goal was. I didn’t understand really how to get from here to there. I started speaking to people, asking a bunch of questions. Andy Ockershausen:	You would have gotten a lot of face-time because I would see you everywhere, and Charlie was helping with that. Andy Ockershausen:	Oh you did? Andy Ockershausen:	And the Metro. Bobby Goldwater:	… well at the time. Now remember, this was in 2000 at the time, great subway system and all these things. He stops me and he says, “Backup a second. What subway system?” I said, “What are you talking about?” And he tries to convince me that there is no subway system in Washington DC and I’m living here now. I said, “Look, I’m from New York. I love the New York City subway system, you get anywhere, anytime, but a very,” again, in 2000, “Very clean, efficient, safe subway system is the Metro.” “How long has it been there?” He says. I said, “24 years. When was the last time you were in Washington?” “Not since the Senators left in 1971,” he says. Okay, so I file that away. The next person I speak to just a couple of weeks later, did not know Washington’s population, did not know that Washington, with the suburbs is the fifth largest market in population in the country. Had no idea. He thought it was just a few hundred thousand people. Bobby Goldwater:	… inside baseball, did not know a basic fact about Washington DC and the light bulb goes off, this is a marketing project. I can do that. Andy Ockershausen:	That’s right, that’s your training. Andy Ockershausen:	That was the trigger. Bobby Goldwater:	… and that’s what we set out to do. That’s what we set out to do. Mm-hmm (affirmative). Bobby Goldwater:	It kind of took. I think, Andy, with all due respect to you and to everybody who is here, I think it took an outsider just to have a fresh start. Andy Ockershausen:	He couldn’t see the forest for the trees. Andy Ockershausen:	I think you’re absolutely right. Bobby Goldwater:	Maybe, because everybody was right. Everybody here was right. Baseball should be here, but they just weren’t telling the story. Andy Ockershausen:	They didn’t give them the reason. Bobby Goldwater:	At least that’s what I came to understand. Andy Ockershausen:	It worked for you, Bobby, it worked for us. Andy Ockershausen:	And this is Andy Ockershausen on Our Town, talking to Bobby Goldwater. What a great story about baseball. Andy Ockershausen:	This is Andy Ockershausen. I’m talking with Bobby Goldwater about Washington and why he came and enlisted in baseball. Fortunately I was involved in the city at the time and with Bobby and watched him from afar because I know how tough it was, but he must have done the right thing because suddenly baseball began to take an interest in Washington. Andy Ockershausen:	They didn’t want to be involved in it. Andy Ockershausen:	You kept it alive. Bobby Goldwater:	… that’s right. Andy Ockershausen:	Well, when did Mr. Angelos arrear? Bobby Goldwater:	Oh, well he was always there. Andy Ockershausen:	Yeah, he was there with, he was always a no. You had to turn him around. Andy Ockershausen:	Somebody had to turn him around. Andy Ockershausen:	They had to do that to . . . Major League Baseball had to do that. Bobby Goldwater:	… nope, I mean we lobbied, but we weren’t trying to convince anybody to move as far as I was concerned, if Commissioner Selig was convinced to relocate a team, he could have moved, the Dodgers or the Yankees as far as I was concerned, did matter me. All he had to do was be convinced that one team should be relocated. Andy Ockershausen:	And can make it here. Bobby Goldwater:	That’s right. And so that was part of our strategy. Andy Ockershausen:	… and Baltimore, correct? Andy Ockershausen:	Oh, they’ve been selling that for all time. Andy Ockershausen:	He gave it to him. Andy Ockershausen:	And nobody challenged it. Bobby Goldwater:	Nope. And he’d been saying it for years. So we did some research and we found out it was four percent. That’s a big difference and with just a little bit of advertising and promotion you can make up four percent. Andy Ockershausen:	And at one time Baltimore was a great baseball city attendance-wise. Andy Ockershausen:	The Orioles were at 3-million some years. Andy Ockershausen:	No, he’s cornered the market. Baseball did that for a reason, but we got our team and they’re still in court of course. And maybe that’ll never be settled between the two of them. Bobby Goldwater:	… I hope it will be. Andy Ockershausen:	It might take somebody’s death to do something, but they’re loggerheads. But Bobby, this is great for you and me. Well, why when baseball came, didn’t you stay with baseball? Was there an opportunity, or? Bobby Goldwater:	No, no, no, my role, my project was to figure out how to bring baseball back here. I left the Sports and Entertainment Commission. The chairman of the commission, after I left, the new Chairman of the Commission, Mark Tuohey was the person who was there when the deal was actually made. Mark and I tease about this all the time. I was the starter, gave it a good seven or eight innings and he was the closer. Andy Ockershausen:	But it worked. Andy Ockershausen:	It brought us baseball. Bobby Goldwater:	And the important thing was that there was a good result. Andy Ockershausen:	That’s a great story though Bobby. Bobby Goldwater:	… but after that, I started a consulting company, which I still run today. It also gave me the flexibility of time being a consultant, so I’ve been teaching for now over ten years at Georgetown. Andy Ockershausen:	At Georgetown. Now you are on the faculty at Georgetown? Bobby Goldwater:	I’m on the faculty of the Sports Industry Management Master’s Program. Bobby Goldwater:	Sports, mm-hmm (affirmative). Andy Ockershausen:	Winning a baseball team. Andy Ockershausen:	Do you have classes, how many people? Andy Ockershausen:	You’re very successful I’ve been told. Bobby Goldwater:	… we have the largest master’s program in sports management in the Country. Bobby Goldwater:	We have 200 people in the classroom, 140 online. I am the longest serving faculty member. I taught the first class on the first night. Bobby Goldwater:	That was in September of 2008 and I’ve taught every semester including the summer since. Bobby Goldwater:	Oh yeah, yeah. Andy Ockershausen:	… to keep your other, your other projects. Bobby Goldwater:	Well, just about the entire faculty are practitioners. We all teach what we know and what we love to do. Andy Ockershausen:	And your school is in the city, downtown? Bobby Goldwater:	Yes, we have a downtown campus at Massachusetts Avenue and Seventh Street Northwest. Andy Ockershausen:	Is the law school close to that or is it still down? Bobby Goldwater:	That’s four blocks, mm-hmm (affirmative), four blocks away. Andy Ockershausen:	… at Georgetown University, of course. Andy Ockershausen:	… you’ve got a great track record, Bob. You had one objective and you did it. Bobby Goldwater:	Well as far as a baseball is concerned, sure. Andy Ockershausen:	How can I get a baseball team, right? Andy Ockershausen:	It was unbelievable. Bobby Goldwater:	And then you also had the example of the arena that transformed an entire neighborhood. Why couldn’t a ballpark do that here? I brought this neighborhood to the attention of the Director of Planning, Andy Altman. This was an August of 2001. Bobby Goldwater:	And he wasn’t really engaged until then. Andy Ockershausen:	Don’t forget the Waterfront, they’ve improved that dramatically too. Andy Ockershausen:	It’s in progress. Andy Ockershausen:	Oh yeah, The Yard. Bobby Goldwater:	… and restaurants and hotels and people are living there now Andy, it is the most gratifying thing. Andy Ockershausen:	Thousands and thousands of people. Bobby Goldwater:	It is so cool. It’s so great. Andy Ockershausen:	And don’t forget the new little soccer stadium, is helping that neighborhood. It all works with the other. Bobby Goldwater:	Yeah, that’s just two, three blocks away. Andy Ockershausen:	You couldn’t have had the soccer field unless you had baseball there. I’m convinced to that. There’s people there. Andy Ockershausen:	But you’re the hero to me. Bobby Goldwater:	… through today. Bobby Goldwater:	The whole thing. Andy Ockershausen:	… but I forget what we call ourselves now. Bobby Goldwater:	The DC Sports Hall of Fame. Andy Ockershausen:	DC Sports Hall of Fame and I know that’s a labor of love because you’ve got to deal with a lot of pains, but you like it and it’s fun. Bobby Goldwater:	Well, Charlie, as he did with all of us who are on the committee, he invited me on the committee years ago and then the two of you very kindly asked me to take over for you to be the Chairman. Andy Ockershausen:	Oh yeah, it’s your job Bobby, we’re dead. Bobby Goldwater:	I love doing it, but it is a labor of love. Andy Ockershausen:	Oh they do. Bobby Goldwater:	… about the history and the contributions that different people have made to DC sports. Andy Ockershausen:	That’s why the classes have been so genuine, I believe and a lot of names came up and a lot of people that I had never heard it before, but they were important to Our Town at one time. So we’re honoring them and I’m so happy that Lerner has embraced it and they love it too, this Hall of Fame. Bobby Goldwater:	Well, Mark Lerner is the real champion of the Hall of Fame. He supports it. We have the banner up beyond left field. The induction ceremony before Nationals games, this is all because of Mark Lerner. Bobby Goldwater:	He’s just the best. Bobby Goldwater:	Nope, that was Major League Baseball. Andy Ockershausen:	Yeah, Major League Baseball. Bobby Goldwater:	… for the first season. Andy Ockershausen:	For three years, didn’t it? Bobby Goldwater:	No, they owned it in 2005 and then the ownership transferred over in the middle of the season in 2006. Bobby Goldwater:	The new stadium, Nationals Park opened in 2008. Bobby Goldwater:	Ryan Zimmerman. I actually went to the game with Charlie. Andy Ockershausen:	Oh, did you? Bobby Goldwater:	It was such a great. Andy Ockershausen:	That was such a great, great ending. Andy Ockershausen:	Well, Bobby, you’re such a fountain of information and such an important part of Our Town. Now you have no chance of leaving Our Town. You’re too successful at Georgetown. LA doesn’t need you. They got a new owner out there, he’s building the football stadium, isn’t he? Which is really a project. Andy Ockershausen:	Another Colorado guy! Bobby Goldwater:	… and owns the LA Rams. And they’re building a palace. Andy Ockershausen:	Yeah. This could be more than a football stadium I hear. Bobby Goldwater:	It’s way more than a football stadium. It’s going to be over a two-billion-dollar sports palace. Andy Ockershausen:	And that’s just the beginning, I’m sure. Bobby Goldwater:	It’s right next to where the LA Forum stands today. People know that neighborhood in Inglewood, California pretty well. Andy Ockershausen:	You fly right over going into LAX. Bobby Goldwater:	It’s going to be magnificent. It’s really going to be magnificent. Andy Ockershausen:	Bobby, what was your feeling during this World Series? Was it a good feeling to see the Red Sox prove something that you can be good all year? Or are you a Dodger fan? Bobby Goldwater:	Well, on one hand, I am neither fan. I guess I was leaning a little bit more to the Dodgers. Andy, I grew up in New York. I am a lifelong Yankee fan. Andy Ockershausen:	Oh . . .
Bobby Goldwater:	Anybody but the Red Sox is how I feel about this. Andy Ockershausen:	I would know that. Bobby Goldwater:	I was at game seven of the ALCS in 2004 when the Red Sox finished coming back from a three-nothing deficit to win. Andy Ockershausen:	I remember that vividly. Bobby Goldwater:	That was a very low-point for a lot of Yankee fans who were at that game that night. That got them started on their way here of this winning. Andy Ockershausen:	It sure did, 16 years ago. Andy Ockershausen:	I still don’t believe I saw that. And I saw it, I watched this game. I watched the last three games. When they won one game I said, “I better start watching this.” So that’s why I watched the last three, but Bobby . . .
Andy Ockershausen:	They’ve won one too many times, the Red Sox Nation needs a little boost. Bobby Goldwater:	To fine too many times, come on. Bobby Goldwater:	The Red Sox were a great team this year. You got to give him full credit. Andy Ockershausen:	Let’s pray, hope and pray someday we can go, like we did this year going to the All Star game, let’s hope and pray we go to a World Series game here in Washington some time. Andy Ockershausen:	It’s come close. Bobby Goldwater:	Let’s win a World Series. Don’t just settle with going to the games. Let’s win one. Andy Ockershausen:	Let’s win one. Bobby, thank you so much. You’re a jewel and thank you for all you do for Our Town. Please stay in Our Town, please do at Georgetown. Remember, tell these kids to get a history lesson, find out geography, find out where Montreal is. Don’t think it’s in another world, because a lot of these kids don’t know and that’s a shame Bobby. They don’t read the paper, I don’t know what they read, but Bobby Goldwater, you’ve been great and we thank to having you on Our Town and we hope this is many, many times, Bobby we’ll get together. Bobby Goldwater:	Thanks very much for having me, Andy. Appreciate it. 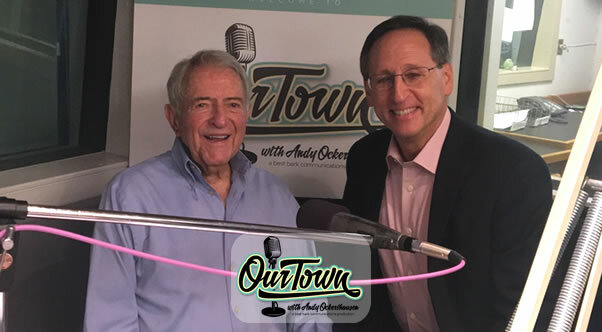 Andy Ockershausen:	This is Our Town with Andy Ockershausen and our guest, Bobby Goldwater. Announcer: You’ve been listening to Our Town, Season 4, presented by GEICO, our hometown favorite, with your host, Andy Ockershausen. New Our Town episodes are released each Tuesday and Thursday. Drop us a line with your comments or suggestions. See us on Facebook, or visit our website at OurTownDC.com. Our special thanks to Ken Hunter, our technical director, and WMAL Radio in Washington, DC. And thanks to GEICO. 15 minutes can save you 15% or more on car insurance.